While lecturing all over the world, I have discovered some common themes among horse owners. It seems that a very large percentage of horse owners learned how to feed their horses from someone they know who has owned horses longer than they have. In every country, I am asked the same question: “I feed X scoops of Brand Z feed and 4 flakes of hay per day to my horse, what do you think of my feeding program?” I am also often asked to comment on a particular feeding program based on whether a horse is fat or thin. Making a sound feeding recommendation based on this subjective information is close to impossible. For centuries, horse owners have described their horses as fat or thin, or some iteration of these terms. The problem is, what is fat in one person’s opinion may well be seen as being fit to someone else. It wasn’t until the early 1980s that a scoring system was first described and finally adopted by people in the horse industry. It was applied initially in academia and related to research to minimize the subjectivity of how fat an animal appeared. Since then, the scale has been widely accepted by nutritionists, veterinarians, owners and trainers to help communicate the measurement of the amount of cover (muscle and fat) on the horse. This body condition score (BCS), a numerical value ranging from 1 (thinnest) to 9 (fattest), is based on palpating (feeling) fat cover in six areas on the horse (see figure 1), with the emphasis on feeling for the fat cover and not just looking at these regions. 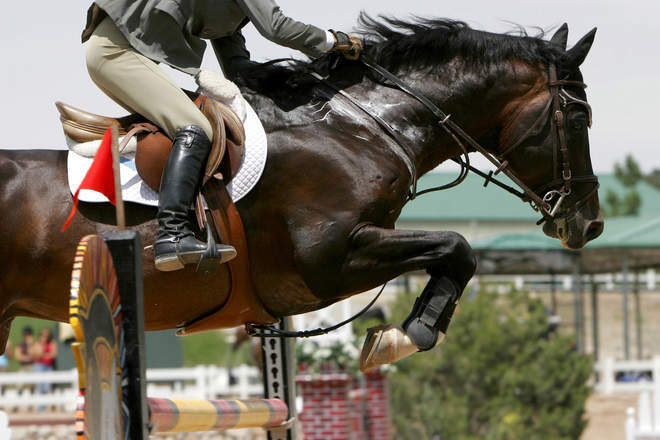 What BCS a horse owner prefers for their horse depends on several factors, including personal preference, the health status of the horse and the horse’s use. Horses that are being shown or prepared for sale are often in a higher numerical group, 6 compared to a 5, than a horse being kept at home. A mare in late pregnancy will often have a higher BCS than the same mare at weaning time since much of the fat cover will have been used as energy during lactation. Hard keepers and horses in high-level training, e.g., racing, may be difficult to get a BCS over 5, whereas some easy keepers, e.g. ponies, require strict diets to maintain a BCS of less than 8 or 9. For most horses, if possible, try to keep the BCS between 5 and 7. Knowing the BCS of a horse also allows for improved communication between the owner and others, e.g., veterinarians. It is also a great way to measure body composition over time and set targets for what BCS a horse should have for specific needs such as competing. To learn more, visit www.vitaflex.com or call (800) 848-2359. Vita Flex and Vita-Hoof are registered trademarks of Farnam Companies, Inc.
Dr. Richard G. Godbee received a Bachelor of Science in Agriculture and a Master of Science in Ruminant Nutrition from the University of Georgia. He received his Ph.D. in Animal Nutrition/Nutritional Biochemistry with an emphasis in equine from Colorado State University. He has numerous publications in peer-reviewed journals and popular press on multiple species. He has presented papers and given invited talks throughout the United States, Japan, Ireland, England, Germany, Switzerland, Norway, Sweden, Finland, Australia, Mexico and Canada. Dr. Godbee is a Director of Product Development in Research and Development for Central Garden & Pet Company. He has served as a faculty or adjunct faculty member of several universities. He has also served on the graduate committees for Master and Ph.D. candidates at numerous universities.